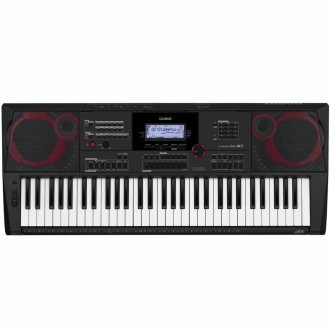 What truly sets the Casio CTX5000 apart from other portable keyboards is its heart: The powerful AiX Sound Source. This technology makes the CTX5000 sound like a keyboard costing hundreds, if not thousands of dollars more. and a huge collection of percussion instruments and sound effects. The CT-X5000 shines on stages. The 1/4? outputs connect to any PA system, mixer or amp. Use an expression pedal (sold separately) to control volume or effect parameters. Connect a mic to the 1/4? mic input, adjust the level with a dedicated volume control, and use the built in mixer to add just the right amount of reverb, chorus, or delay to your voice. The CTX5000 features a very powerful 30-watt speaker system protected by tough metal grills. It's compact, lightweight and rugged, with a tough molded case, making it the perfect go-anywhere musical partner. Available until 11 PM (EST) today. Mention special code 209-Y8NX when you call.